Technical and Business Systems (T&B Systems) has over 30 years of experience in designing, integrating, managing, and operating air quality and meteorological monitoring networks throughout the United States and abroad using Campbell Scientific equipment. 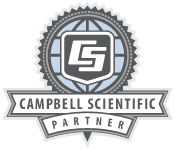 T&B Systems specializes in taking on the integration of Campbell Scientific equipment to a higher level. This includes automated data acquisition systems, displays, automated diagnostic checks, live alarms, real-time web displays, climate control, remote sensing technologies, and mobile monitoring systems.